On March 8th, International Women's Day, Simply the Basics & Givdo hosted a day of empowerment, learning, and action! The Women's Action Planning Forum took place at The Women's Building, a perfectly themed venue for the 85+ attendees. The idea for the event came after the Women's March when many of us were feeling the "post-march blues" because we weren't sure how to make real impact. Rather than waiting for someone to tell us - we decided to come up with those actions on our own! Beginning with a chance to network and enjoy City Smoke House for dinner, there was a lot of energy in the room and a lot of red shirts in solidarity of the holiday. We had a panel of leaders from a variety of social services speak moderated by our founder, Meghan Freebeck. The panel included Kara Zordel of Project Homeless Connect, Ashley Raveche of the League of Women Voters, Tara Medve of Women's Community Clinic, Jessica Lobedan of NAMI-SF, Molly Wertz of Tandem Partners in Early Learning, and Mallory Casperson of Lacuna Loft. The panelists answered difficult questions about how women face unique challenges as they relate to their services, what is currently being done to support them, and what is most needed in the community. (From the Left) Mallory Casperson, Jessica Lobedan, Molly Wertz, Ashley Raveche, Tara Medve, Kara Zordel, and Meghan Freebeck. Kara inspired us to consider "what really happens when the couches run out" and how housing is the core solution to homelessness. Ashley reminded us not to wait to run for office, and we changed the slogan "Yes We Can" to "Yes We Are!" for women who feel they aren't fit for a role. Tara reminded people to donate to local, community based organizations where dollars go further, and reassured us that no matter what happens with the ACA, that community nonprofits will continue offering healthy options to women in need. Jessica de-stigmatized depression and mental health regardless of gender and Molly encouraged reading together as a family as a way to engage young boys and girls. Mallory, a social entrepreneur, inspired us to be ourselves and succeed as our true self, rather than changing to fit an idea of what a leader should be like. All of our panelists inspired us to become leaders in our passions - and to work as a community to reach goals, because nothing can be accomplished alone. We were so grateful to have such profound leaders share their stories and impact with the group! The next phase of the event was to create actual strategies for supporting women. The attendees split into groups and using an Action Planning template created by our team, got to work on thinking about challenges they could solve, what would be needed, timelines, and activities that anyone in the community could participate in easily to create real, lasting change. Here are summaries of the incredible activities created by participants, we hope you will join them! A Day Without Undies! A campaign is being coordinated to collect new underwear for people experiencing homelessness. 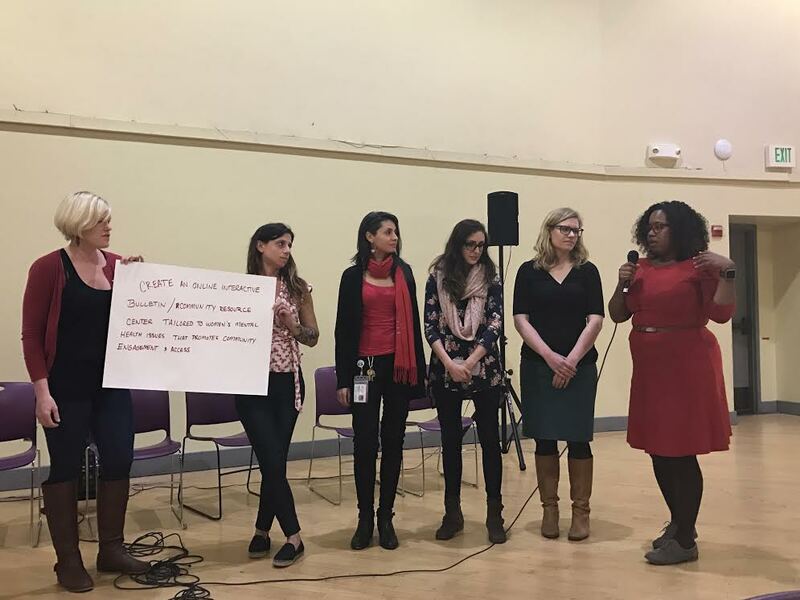 In order to help share and find information about mental health issues, one group will create an online interactive bulletin of community resources tailored to women’s mental health issues and will promote community engagement and access to reduce stigma. Attend or organize a fun community event to discuss issues and candidates and create civil civic discourse by bringing diverse opinions together in a safe and peaceful space centered around learning. Invite people with different views, and make a group goal to all really listen! Pick a monthly health cause and find a local nonprofit to raise donation money. Each month will use social media to promote, bonus points if you can get the marketing/social outreach departments at big companies involved through their resources. Help people find volunteer opportunities that they are most interested in and best fit their skills by offering a quiz where the end result is a connection to an organization. As a way to spread the word about nonprofits and causes that are less known, we will all work to share ways to get involved with local charities through Facebook, Twitter, e-mail, etc. You can enjoy more photos on our Facebook Page - we hope to see you at our next event!